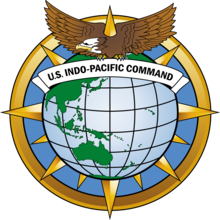 United States Indo-Pacific Command (USINDOPACOM) is a unified combatant command of the United States Armed Forces responsible for the Indo-Pacific region. It is the oldest and largest of the unified combatant commands. Its commander, the senior U.S. military officer in the Pacific, is responsible for military operations in an area which encompasses more than 100 million square miles (260,000,000 km2), or roughly 52 percent of the Earth’s surface, stretching from the waters off the west coast of the United States to the west coast of India, and from the Arctic to the Antarctic. The commander reports to the President of the United States through the Secretary of Defense and is supported by service component and subordinate unified commands, including U.S. Army Pacific, Marine Forces Pacific, U.S. Pacific Fleet, Pacific Air Forces, U.S. Forces Japan, U.S. Forces Korea, Special Operations Command Korea, and Special Operations Command Pacific. USINDOPACOM also has two direct reporting units (DRUs) - U.S. Pacific Command Joint Intelligence Operations Center (JIOC) and the Center for Excellence in Disaster Management and Humanitarian Assistance (CFE-DMHA) as well as a Standing Joint Task Force, Joint Interagency Task Force West (JIATF-W). The USINDOPACOM headquarters building, the Nimitz-MacArthur Pacific Command Center, is located on Camp H.M. Smith, Hawaii.